Today's post is bit special. Special because it features a polish I should have posted along with the rest of the Fan collection but mainly special because the pictures I have taken are completely out of my comfort zone. 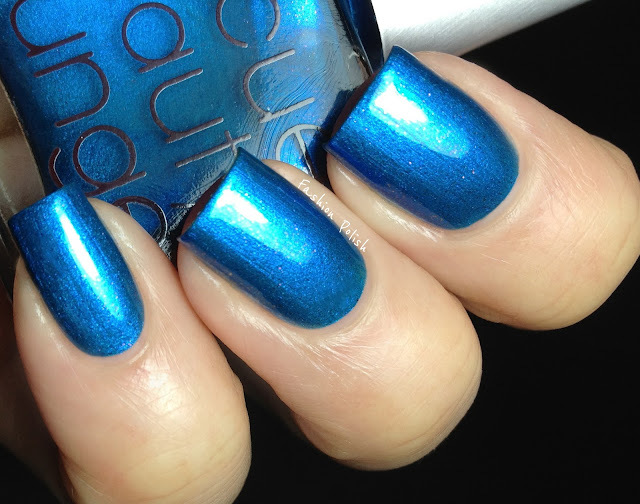 Cuprum is a very vivid blue shimmer infused with very small copper glitters. 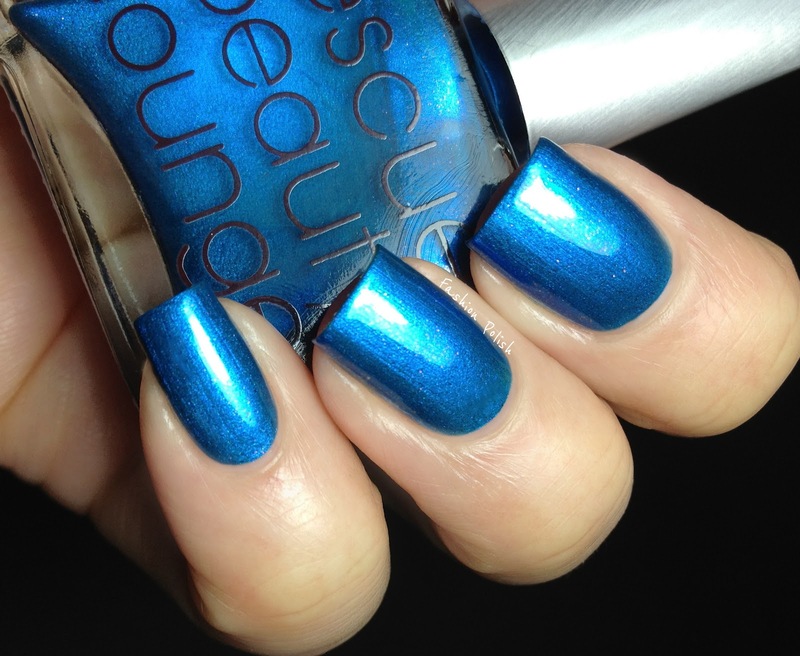 It looks almost metallic but not quite and is actually packed with an abundance of blue shimmers. Formula was really nice and easy to work with, quickly applying in 2 self levelling, fast drying, coats. Cuprum is unique in my collection and truly a stunner in real life : the utterly sparkly glitters and saturated base color catch the light in a beautiful way! 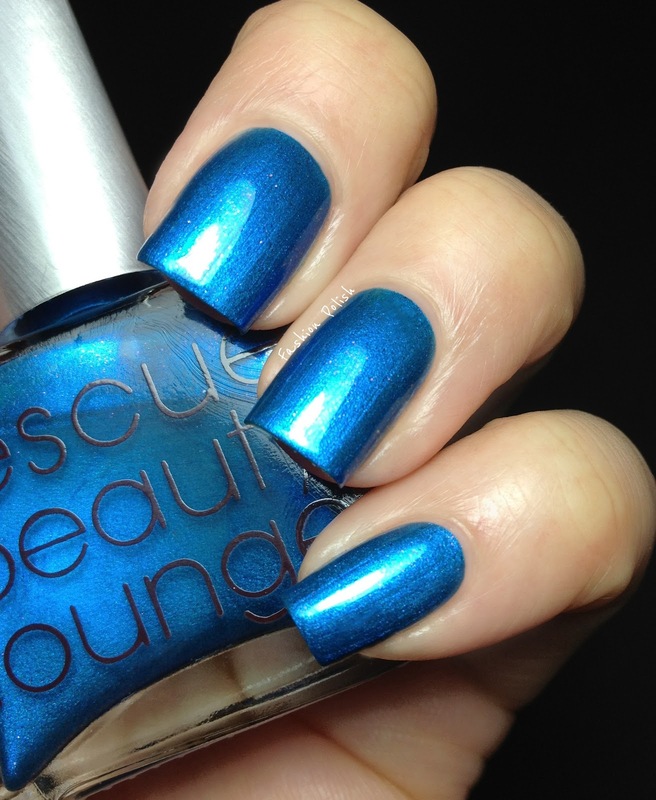 Cuprum is, along with Halcyon, still available for purchase on the Rescue Beauty Lounge website and retails for $20. Beautiful color. Maybe it's because I have an Iphone 4 but your phone takes some awesome pictures for a cell!! Okay, so now I have a WEE bit of regret for passing on Cuprum. I have this one too. It is so gorgeous! OH, I'm out of breath, this is stunning, thanks for sharing! oh my! i thought it was something serious! hahah loving how the iphone photos came out... very professional! you have me convinced that i need this color in my collection. i was gonna pass it up but your photos are hypnotizing me!! lol. This blue is so deep! It's definitley pretty unique! But very nice! I'm total fan of blues! Just now I tried to make a swatch with iphone too...and it captured the colors of shimmer, which the camera couldn't! I got the whole collection, and swatchsicled them... Cuprum is definitely my favorite of the bunch. It applies great and is so pretty. My only wish is that (at least some of) the copper particles were a little bigger. They are a bit hard to see unless you're really looking.